1. 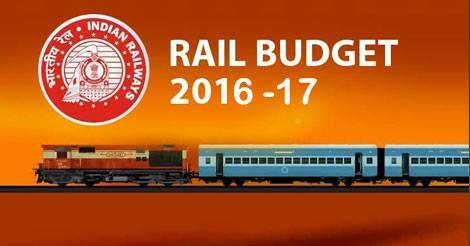 What is the theme of the Rail Budget 2016-2017? 2. What is the name of the proposed long distance superfast train, which will be introduced for unreserved passengers? 3. Service named Sarthi Seva for senior citizens will be first introduced in which Indian Railways Zone? 4. What is the Targeted Operating Ratio for the Indian Railways for the year 2016-17 in the Railway Budget? 5. Name the proposed fully air-conditioned third AC service with an optional service for meals? 6.Llong distance trains for unreserved passengers with facilities such as potable water and higher number of mobile charging points. What these coaches will be called? 7. In the Rail Budget 2016-2017, a new service named Janani Sewa will be introduced. What is the aim of this service? 8. uresh Prabhu announced a new overnight double-decker, air-conditioned train. What is the name of the proposed train? 9. What is/are the goal(s) of the Rail Budget 2016-2017? 10. As per the Rail Budget 2016-2017, what is the proposed investment for modernization of railway infrastructure to be spent over 5 years?